One week following an interesting Brickyard 400 race at Indianapolis Motor Speedway, the NASCAR Sprint Cup series takes on another 2.5 mile track in the form of the triangular-shaped Pocono Raceway. Through Friday afternoon qualifying for the Sunoco Red Cross Pennsylvania 500 saw driver/owner Tony Stewart sailing his Chevrolet on to the pole for Sunday's event. 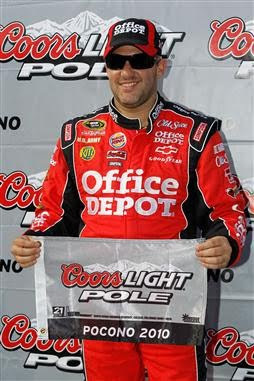 Taking top spot at 171.393 miles per hour for the his 2nd pole of 2010, driver Stewart remains winless after 20 races. The Pocono qualifying session proved strong for the Stewart/Haas team as Ryan Newman placed the organization's #39 Chevrolet into 5th on the starting grid. Starting second, Juan Pablo Montoya rolls into this weekend with some popular scars from the past race at Indy. With a car to beat at the historic track, a mistake in pit strategy and a late race crash which collected Dale Earnhardt Jr saw the #42 Target Chevy of Earnhardt-Ganassi Racing end in the garage. The intense Montoya secluded himself immediately following his car's retirement from the Brickyard 400 but he returns to Pocono hungry for his first career NASCAR Sprint Cup win on an oval. With less of a trouble finding victory lane, Joe Gibbs Racing's Denny Hamlin has five wins in the #20 FedEx Toyota including the NASCAR Sprint Cup's June event at Pocono. Hamlin will be starting the Sunoco Red Cross Pennsylvania 500 in 3rd spot ahead of Jeff Gordon, Newman and Jimmie Johnson. NASCAR Sprint Cup's Sunoco Red Cross Pennsylvania 500 is planned to receive its command to start engines at 1 P.M. Eastern time. However, weather forecasts are threatening the Long Pond, Pennsylvania track race Sunday. A 60% chance of thunderstorms exist in the area according to the Weather Channel.